There are many reasons to opt your child out of the Smarter Balanced Assessments. We now know that the children of South Dakota are not being assessed on their academic progress, but instead, are being used to serve the needs of a private consortium. It seems to me that parents have every right to opt their child out of an activity that has nothing to do with their education and is not required by law. Dr. Melody Schopp has penned a letter to the Tri-Valley school district saying that according to SD Codified Law, students must me assessed annually. She also said that if you choose to opt your children out of the SBAC assessment this spring, you could be in violation of truancy laws. This is a portion of that letter. 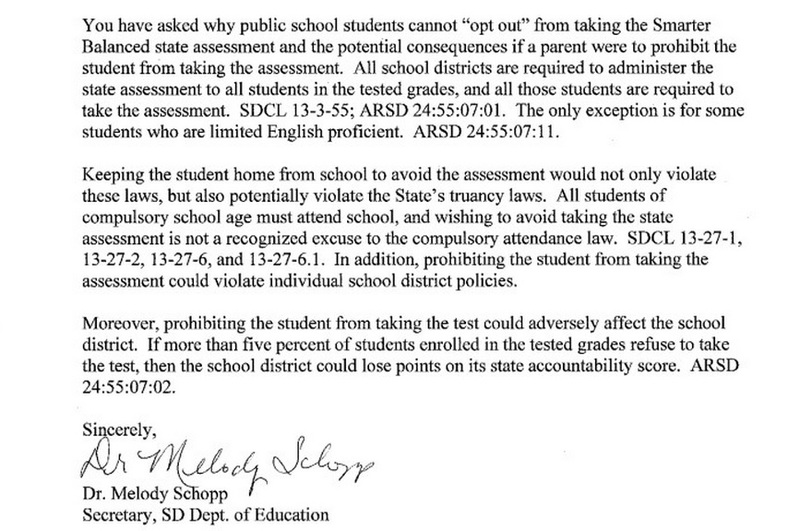 It seems by her wording that Dr. Schopp is more concerned about the schools district’s accountability. Yet, United States Secretary of Education, Arne Duncan, has given flexibility, and the assessments in 2014 will not be used in the school or teacher accountability model. This is the law Dr. Schopp is referring to in her letter. SD Codified Law 13-3-55. Academic achievement tests. Every public school district shall annually administer the same assessment to all students in grades three to eight, inclusive, and in grade eleven. The assessment shall measure the academic progress of each student. Every public school district shall annually administer to all students in at least two grade levels an achievement test to assess writing skills. The assessment instruments shall be provided by the Department of Education, and the department shall determine the two grade levels to be tested. The tests shall be administered within timelines established by the Department of Education by rules promulgated pursuant to chapter 1-26 starting in the spring of the 2002-2003 school year. Each state-designed test shall be correlated with the state’s content standards. The South Dakota Board of Education may promulgate rules pursuant to chapter 1-26 to provide for administration of all assessments. Given that parents, teachers and schools will not receive results of the assessment to be given, there is no way to measure academic progress. You can read more about that here and here. You can find an opt out guide specific to South Dakota at United Opt Out National. A letter simply needs to state that you are refusing the tests. If you choose to share why you are refusing,etc., you are welcome to – but that is your choice. Here is the letter, written by one of the founders of United Opt Out National, regarding her child not taking the assessment. There are samples of letters written from parents in other states here. Below is a sample letter that can be used to help you write a letter to your district.